I heard somewhere that Chris Brogan chooses three theme words for every year. I can’t remember where – it might have been straight from the horse’s mouth. I thought about it, and I liked the idea. 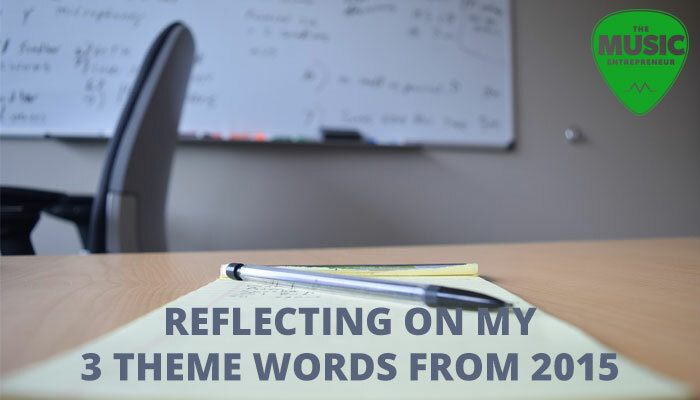 So although I never actually mentioned it here on the blog, I chose three words for 2015. Let me explain what went into each of these words. Quite simply, I wanted to make a profit with The Music Entrepreneur. Not just revenue, which doesn’t account for expenses, but income over and above that, which would allow me to reinvest, pay myself, or save up. So did I make a profit? I guess that depends on how you look at things. If I were just to look at the eBook and course sales from 2015, I don’t think I was profitable. But if I take into account the fact that the existence of this site led to opportunities with the likes of Music Industry How To, yes, 2015 was definitely profitable. Profit will not be a major focus for 2016, because I believe serving others will lead to the greatest rewards of all. The idea here was to build new relationships, create more strategic partnerships, and get the word out about the site. I used my monthly link roundps as a device to achieve this end. I linked to other people’s articles, and then pinged them letting them know that I had featured their article. The results are a little suspect, but in general I would say that my audience has broadened, my traffic has increased, and I have created a few more closer working relationships, regardless of whether or not the thing that I thought would do the job did it or not. I also connected with several new people on the podcast. This was totally worthwhile, and I would do it all over again. In 2016, I will actually be focusing on this less. I will be building relationships, but I won’t be worrying about outreach as much. It seems to make so much more sense for my personality type and the way I work to focus on individuals rather than larger groups. My goal here was to grow the site, build the audience, and offer more resources. It’s pretty vague, I suppose, but I think I achieved that end. I released my new book in June, and many of the tools and guides you find on the resources page were also created in 2015. And as I said earlier, the organic traffic to the site has also been on the rise. But expanding is a lot of work, and I already talked about the sometimes tiresome/tedious nature of episodic/serial content on the last episode of the podcast. I’ll certainly be taking a different approach here in 2016, but I am definitely proud of what I was able to accomplish last year. Flow. Because I intend to spend longer stretches of time focused on one project (as opposed to jumping around from one task to the next), getting into a flow state more often is going to be key to my success this year. Create. I’m pretty clear on my goals for this year. I plan to dedicate my most productive hours (outside of work) to the completion of the projects outlined on that page. I also intend to, as much as possible, work on one thing at a time to see it to its completion. Helpfulness. I need to appreciate my own limitations more. I want to serve the world in the ways that I can, and worry less about the ways in which I can’t. I intend to create from the perspective of others so that I can add more value to them. What are your three words for 2016? Feel free to let me know in the comments section below.